Forming a rock band in Denmark in 1968 meant that albums such as Jefferson Airplane�s “Surrealistic Pillow” or Love�s “Forever Changes”, along with the work of other US West Coast bands, would most likely be a strong inspiration. Not just due to the many boundaries questioned by all these amazing records at that time but also because of the dreams of golden sunsets in acid California that were evoked through most of this great music, which looked understandably attractive to the eyes of any young Scandinavian. Ole Prehn on guitars, Erik Stedt on piano and bass, Henrik Friis on drums, Karsten Lyng on lead guitar and Hans Lauridsen on vocals formed Day Of Phoenix that year under the influence of the “Endless Summer”, but they were also very skilled musicians looking forward to challenging the traditional three-minute song length. 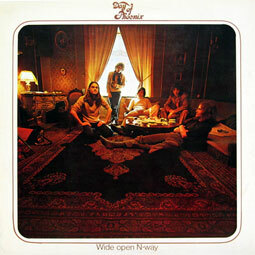 “Wide Open N-Way” is their 1970 debut album, produced by Tony Reeves (bassist in Colosseum). The band delivers an epic collection of melancholic songs (three of the five tracks on the LP clock in at past ten minutes) with extended instrumental sections that at some point seem to explore the paths of free-jazz. Nevertheless, this is not a chaotic piece of music but a very well balanced, structured and harmonious recording of loose psychedelic and progressive rock at its best. Day Of Phoenix fell apart after Erik Stedt died unexpectedly and an uninspired follow-up album brought about the band�s dismantling.